THE SAFETY HOOK & LADDER Co.
is a great introduction into the fun world of Hydrocal model building. The Safety Hook &Ladder Co. Firehouse will please the novice as well as the seasoned craftsman model builder. Actually, it was my first hand-scribed brick model. It is the perfect introduction into fine scale brick modeling in Hydrocal- not too large or expensive but packed with fine scale detail. The model kit comes with complete step-by-step instructions to insure your total enjoyment, both with the model kit building experience and the finished model. 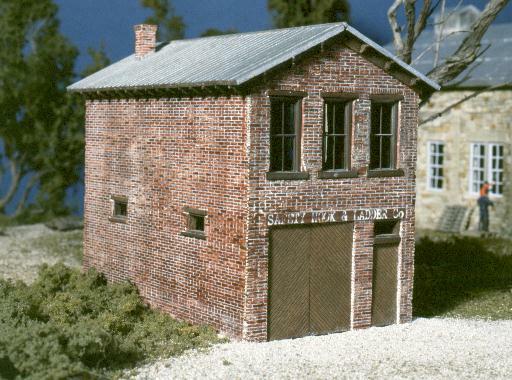 Based on the Orbisonia, Pennsylvania prototype, this small one-engine brick firehouse should easily find itself a spot on your layout. The kit features my fine scale hand-scribed brickwork with cast doors, roof and chimney. Grandt Line windows are included along with simple stripwood construction for the smaller ones. This model was subject of my construction article featured in the November 2000 Model Railroader. 18' x 30' ( 2-1/2" x 4" ) in HO scale. SORRY- this kit is resting for a while. A photo of my original hand-scribed model that the kit is based on. 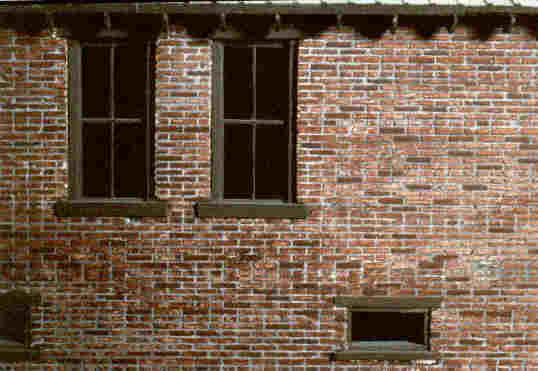 Detail of my original Firehouse wall. This was my first brick work. 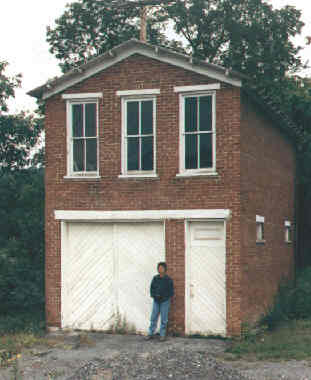 The prototype still stands today in Orbisonia, Pennsylvania. Here are a bunch of my on-line how to work with Hydrocal mini-clinics. Each kit includes specific instructions of course- and there are lots of ways to do things, but here are my thoughts, tips and techniques. My traditional techniques for coloring and mortaring brick. With a little practice you can color realistic stone walls. Here's how I do it. What are we going to do now that Testors/Floquil has dropped their Flo-Stains? If you like to scratch-build or just want to practice before you do, check out my stock castings. These are the same building blocks I use to create my kits. I have three different grades available. Use as retaining walls, cut them up for foundations, or make whole new buildings. The roof stock, my Cedar Shake Roof - fine, CSR-f, is available seperately. This is great stuff to have. Use for buildings, roofs, and what have you. is a great introduction to modeling stone in Hydrocal. This is one of my personal favorites, and indeed, one of my most popular kits. is the perfect match for the German Colonial. It has the same type stone walls. In fact I definately tried to match them. The roof is different though, a seamed metal affair. Or how about another barn. This one features lots of board-by-board construction on top of a simple cobblestone foundation.